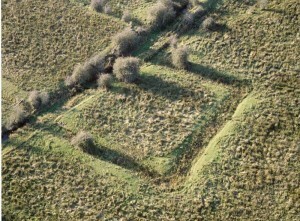 Moated sites are rectangular shaped enclosures that are primarily associated with the 13th and 14th century Anglo-Norman colonisation of Ireland. They were most likely the homes of minor lords and well-to-do tenant farmers and would have formed the focal point of large agricultural estates. 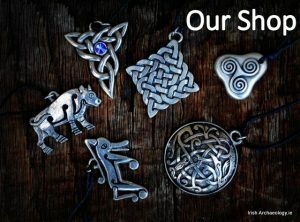 In some instance they may also have represented outlying grange farms associated with monastic establishments, while research by Dr Kieran O’Conor has indicated that a smaller number, especially in the north and west, may have been used by Gaelic Lords (O’Connor 2000). 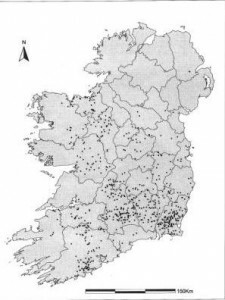 It is estimated that there are close to 1,000 moated sites in Ireland (ibid), with the vast majority occurring in the south and east, where there are notable concentrations in counties, Wexford, Kilkenny and Tipperary and Limerick. They were often built on the outer edges of the Anglo Norman colonies and it has been suggested that they may represent a second wave of settlement into more marginal land (see Empey 1982). These areas came under increasing pressure from Irish attacks in the 13th and 14th centuries and this may have necessitated the construction of more defensive settlement types (see Barry 1987). Moated sites are normally defined by a large and deep ditch, with an internal bank of clay (the ditches are often no longer visible, having completely silted up). 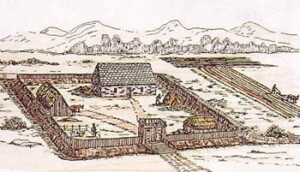 For added protection the bank would have been surmounted by a wooden palisade of stakes or planks, as is recorded at Ballyconner, Co. Wexford (see below). The entrance was protected by a large timber gate with some sites also having evidence for guard towers/gate houses, for example Rigsdale, Co. Cork. 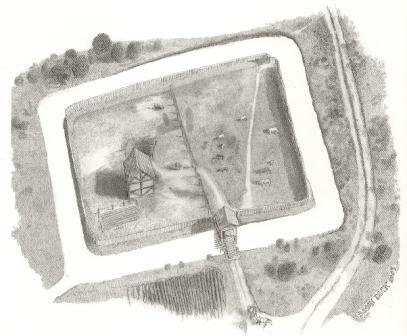 The presence of tower, especially if manned by archers, would have been a significant addition to the sites defences. The gateway was typically accessed via an earthen ramp or in more elaborate examples, via a drawbridge, as seen at Coolmurry, Co. Wexford (Fagan 2005). In many cases moated sites were built close to a stream or spring, so the surrounding ditch/moat could be flooded with water for additional protection. The internal dimensions of the sites vary but the majority appear to have platforms which measure between500m and 2,500m squared. We are lucky that a detailed account for the construction of a moated site survives from Co. Wexford in the account rolls of the manor of Old Ross. It describes how, in the years 1282-3 and 1283-4, 66 perches of moat were dug around the haggard or farmstead of Ballyconner (Mylerspark, Co. Wexford; see Colfer 1996). The most expensive item described during the build was the wooden palisade, which cost over £10 to construct. The stakes for the palisade were fashioned out of tree trunks, which were sharpened and then driven into a foundation trench. It was obviously a substantial structure as a total of 18 carpenters and their assistants were involved in its build. One of these workers was referred to as Thomas the Ditcher and this man was probably also employed in constructing the surrounding moat, which cost over £3 to excavate. The rolls also describe the construction of a gate for the site which cost 8/6d for build and carriage. The cost of transporting the gate to the site was particularly expensive (5/3d) leading Dr Terry Barry to suggest that it may have been a very substantial affair, perhaps even a gate tower (Barry 1977, 10). Possible evidence for just such a structure was recently uncovered at a moated site at Coolamurry, Co. Wexford, where the remains of what may have been a wooden gate tower and an associated drawbridge were found (Fagan 2005). A number of recent excavations have given us an insight into what the internal layout of a moated site may have been like. It appears they typically contained at least one large building, probably a hall house, as well as ancillary features such rubbish pits, stone lined drains, metalled path ways and yard areas. 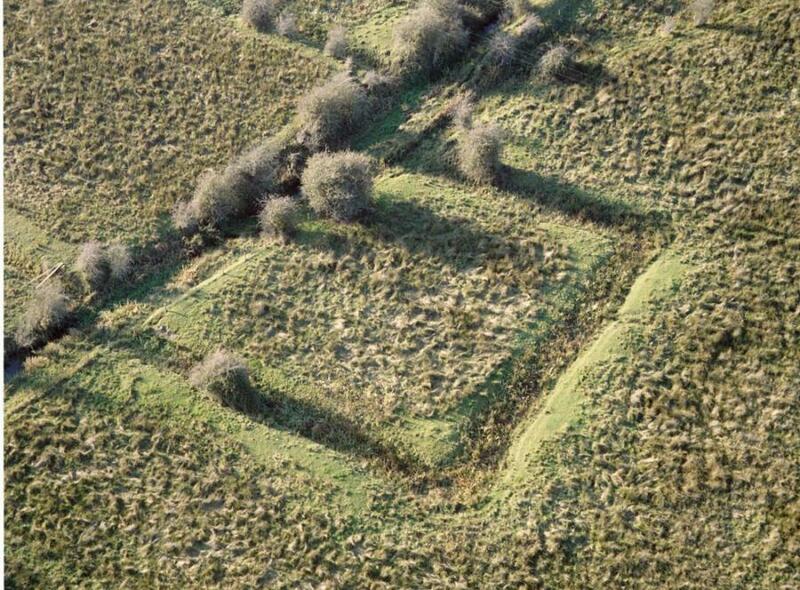 For example at Carrowreagh Co. Wexford, a moated site defined by a ditch 2m deep by 4.5m wide, had evidence for a large rectangular building which appears to have been constructed out of earth fast sill beams. The inhabitants of this moated site also made their own pottery as evidenced by a kiln that was identified just outside the enclosing ditch. Unsurprisingly then large quantities of medieval ceramics (mainly locally produced wares) were recovered from this site along with evidence of food waste in the form of butchered animal bone and charred cereal grains. At Coolamurry, also in Co. Wexford, an excavation revealed another large wooden building, this time defined by stakeholes and slot-trenches that was located in the eastern side of the site. The western side of side of the enclosure, which was separated from the building by a north-south ditch, may have been used for keeping livestock, as well as other farmyard activities. Stone structures were also sometimes constructed at moated sites, for example at Rigsdale in Co. Cork, the remains of a large stone building, approximately 20m long by 8m wide was identified within the interior of the enclosure. This moated site appears to have been abandoned shortly after it was built, possibly in the 1320s as a result of attacks by the First Earl of Desmond in conjunction with Dermot McCarthy (Barry 1987, 91). 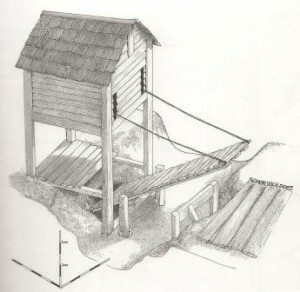 As this last example demonstrates moated sites, despite their obvious defensive features, were not designed to withstand a concerted attack by a large group of well armed men. Instead, they were probably intended as protection against opportunistic bands of cattle rustlers and thieves. 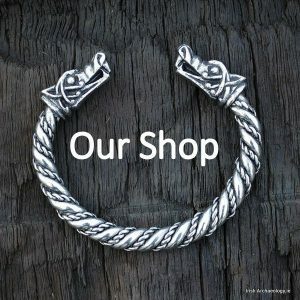 The fact that so many were constructed in the troubled borderlands of the Anglo-Norman colony suggests that they must have been a pretty effective deterrent . A really excellent article! – very informative. Nice article with excellent illustrations. A useful article. Thanks for posting it. I think that there was an unidentified moated site in Ballinteer, co. Dublin now with apartments built on it. We tried to have it investigated, but you don’t win them all! Came across ‘moated site’ marked on a map and had no idea. Now I feel well informed. Thanks.